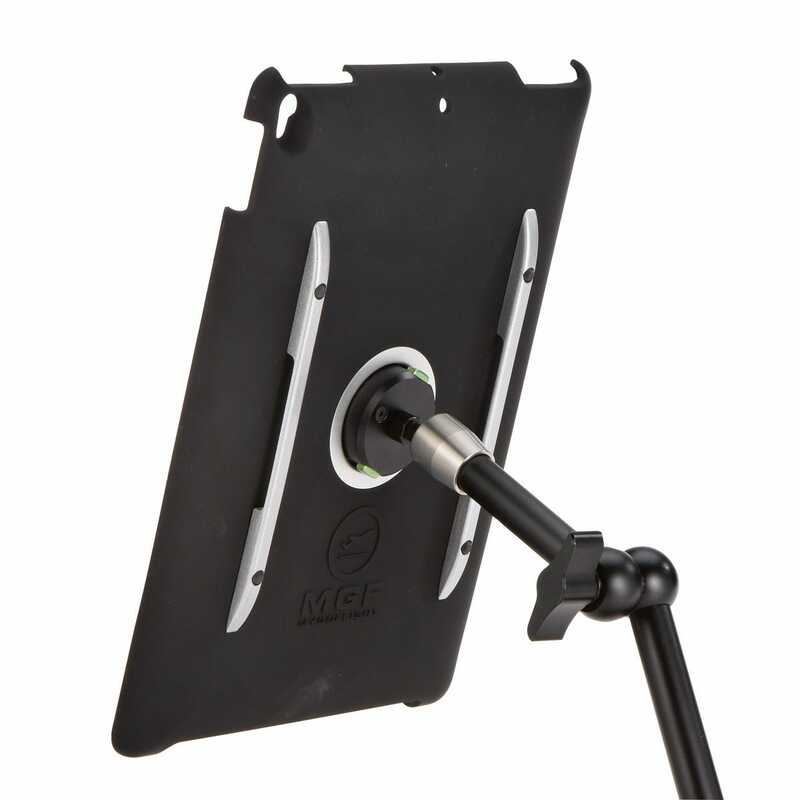 MyGoFlight (MGF) makes the most premium tablet mounting cradles and hardware you can buy for your airplane. These are designed so the pilot doesn’t have to compromise on where you can mount your iPad. All components of the system are made of the highest quality materials, mostly aluminum and steel, built to last forever. Using German engineering, the MGF arm is where the versatility comes in to play. With one simple twist lock in the center you can loosen and tighten every joint in the system. This makes adjustment a breeze. You can have one hand on your iPad making fine adjustments and one hand on the twist lock to increase the tension. When tightened, the MGF arm is as sturdy as they come so you can have confidence that the iPad will not become a hazard in flight. The arm features adjustable collars at each end for rotation and an elbow joint in the middle for navigating around the unique angles in your plane. 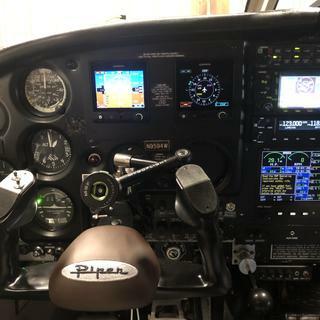 The MGF arm can easily work around the yoke on most planes. 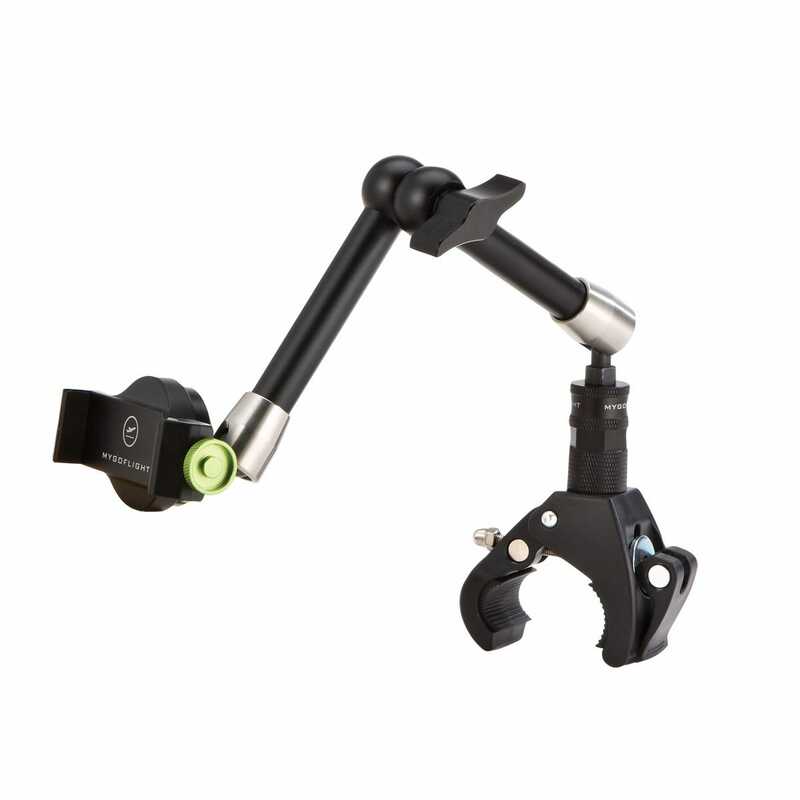 At its smallest, the MGF system can mount a device 5.5 inches away from a tube or bar (including the claw mount). The system can extend to a length of 13 inches (including the claw mount), giving you optimal reach to bring the iPad where you need it. The claw is adjustable to accommodate tubes as small as 3/4” all the way up to as large as 1 3/4”. The width of the claw is 1 3/8”. To attach the claw simply screw the claw closed until it’s snug, then flip the level to lock the claw down tight. The claw has a grooved rubber pad built into the clamp that both protects the tube it’s attached to and adds friction for extra sticking power. 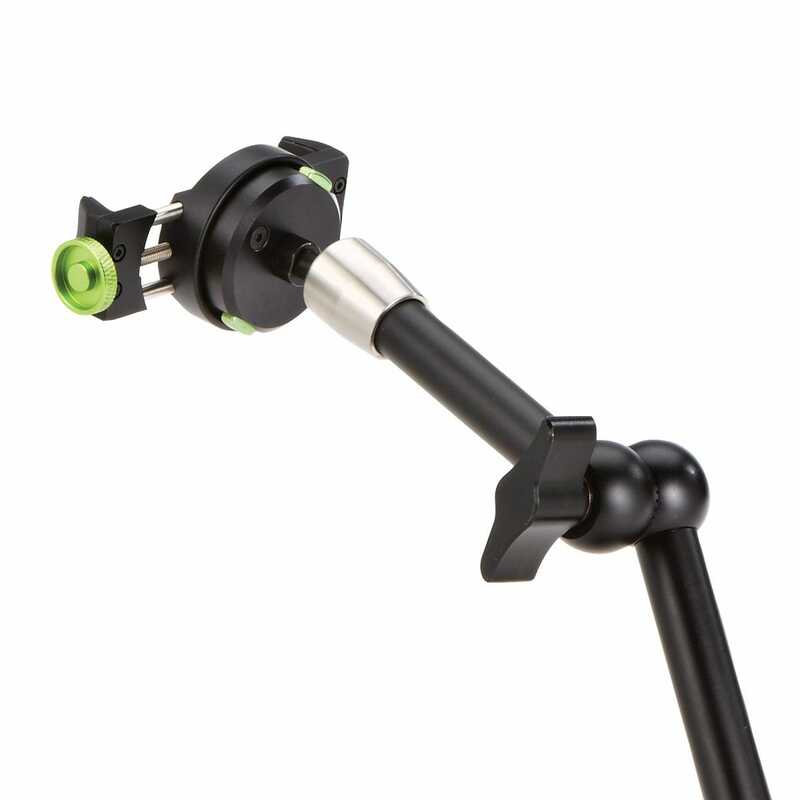 All cradles feature a circular “Quick Connect” mount that attaches to the end of the MGF arm. 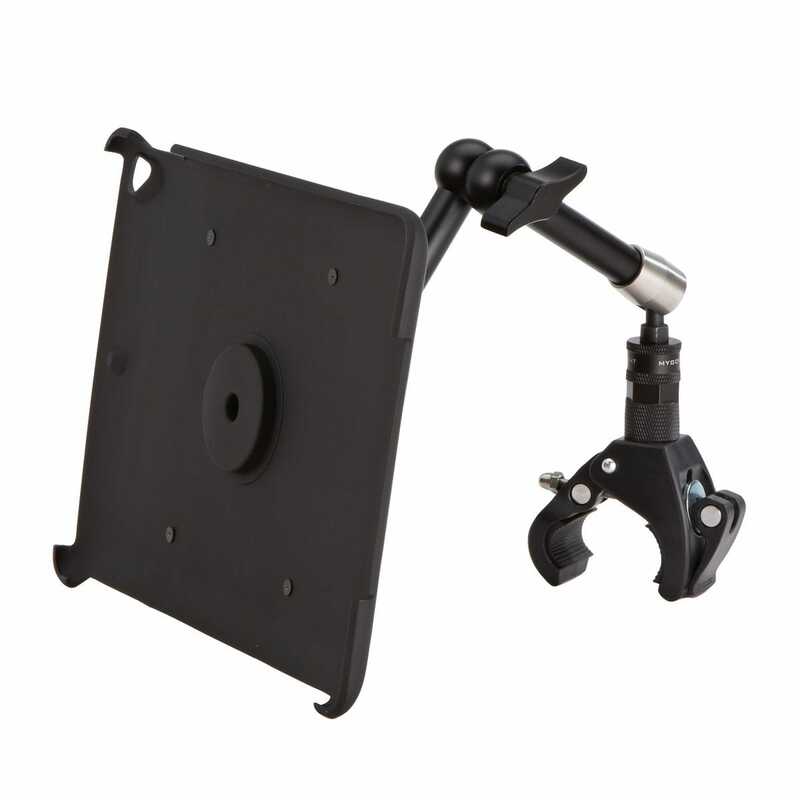 With this mount, you get 360° of rotation great for easily switching from landscape to portrait view on your tablet. 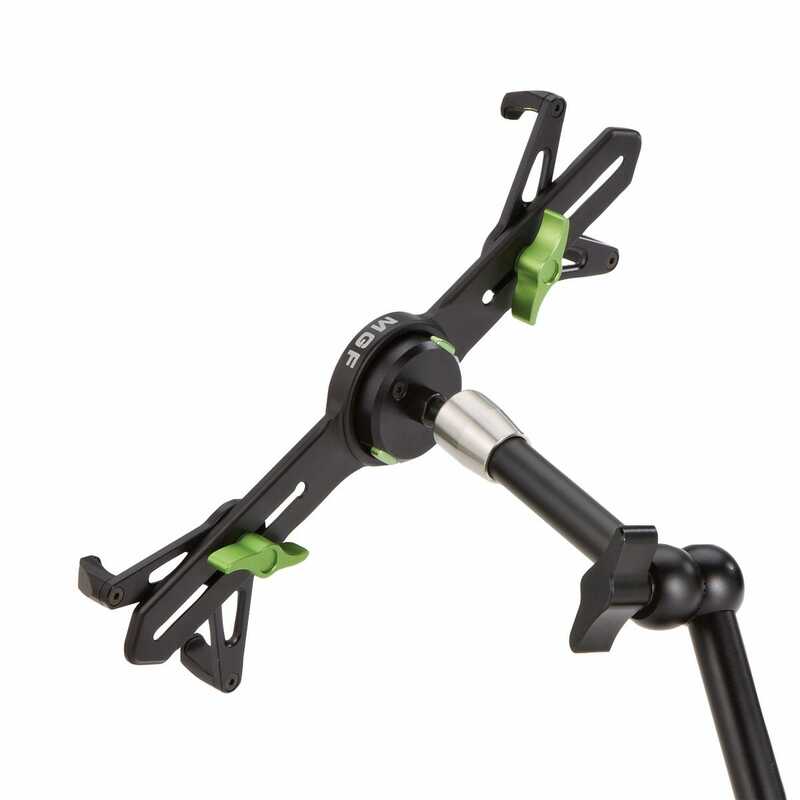 Two green buttons on either side of the Quick Connect mount release the cradle. The cradle can be easily removed so you can take the cradle with you in your flight bag. There’s two types of cradle options you can choose from with this bundle. The Sport Cradle or the Universal Cradle. Both provide excellent security for your iPad, here’s what’s different. The sport cradle snaps over your iPad and doubles as a full-time case. Made of a soft to the touch polycarbonate but with sturdy protection. 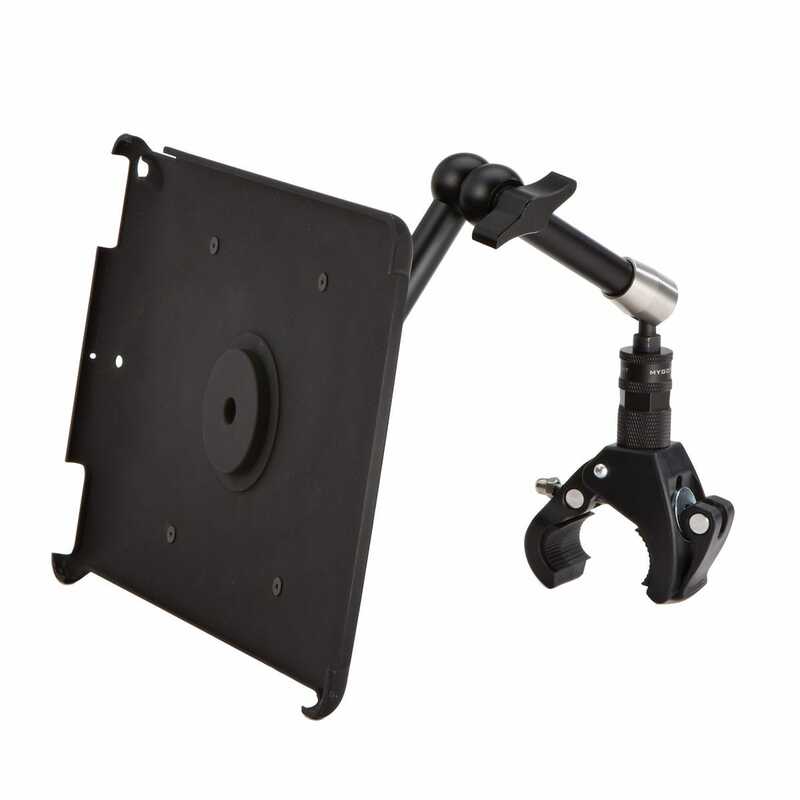 This cradle still allows access to all ports, speakers, cameras, and buttons. It has a slim design and works with the Apple Smart Magnetic Cover. On the back of the case, there are 2 silver grips which make holding the iPad easier and the grips have a strap pass through so it can double as a kneeboard. The strap is included with the Sport cradle. If you’re considering using a kneeboard part time and a mount part time, this is your best option. This is the future proof mounting system. The Universal Cradle is designed to work with almost any tablet in virtually any case, or no case at all. The universal cradle will accommodate iPad Minis all the way up to the iPad Pro 10.5”. 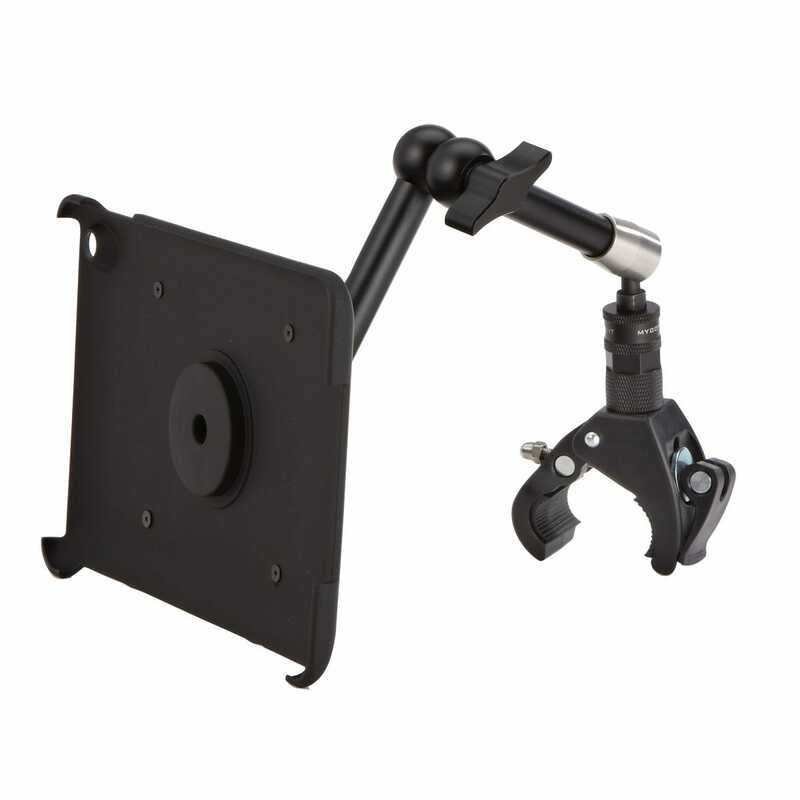 As a mountable, it connects and easily rotates when paired with MGF Sport Mounts. The arms of the cradle are adjustable via quick release knobs making it easy to insert and remove your tablet. Weighing only 4 ounces the Universal Cradle is incredibly light-weight. No matter how you use it, the Sport Cradle meets the demands of pilots operating in extreme motion. If you’re looking for the best quality mount you can find for your plane, look no further. 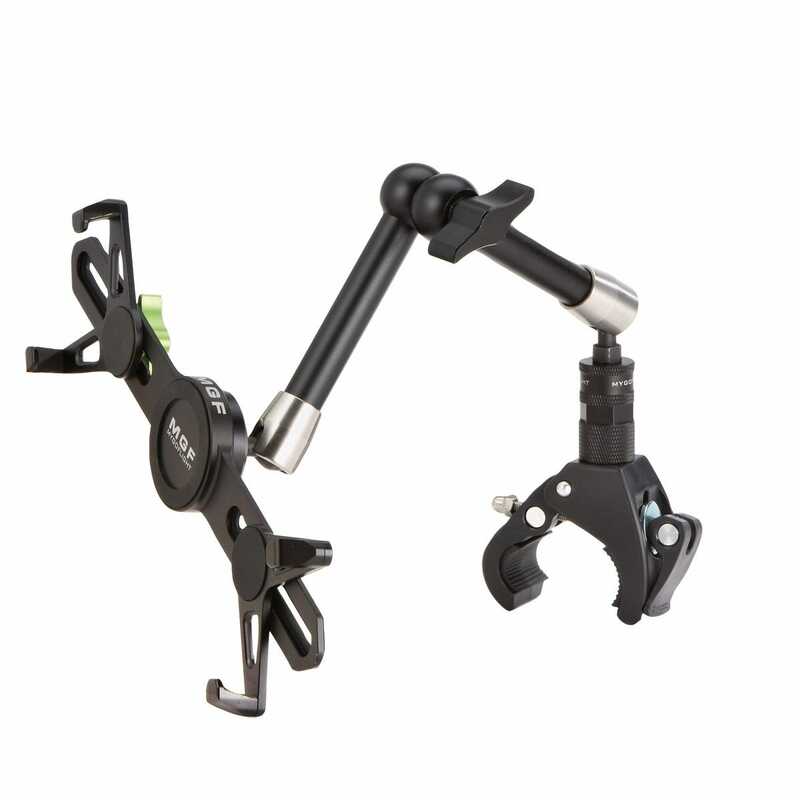 The MGF Claw Yoke Mount with Cradle Bundle is most adjustable and has the best build quality of any yoke mount. With the MGF Bundle, you get everything you need for the complete mount and save money with your purchase compared to buying the same pieces separately. 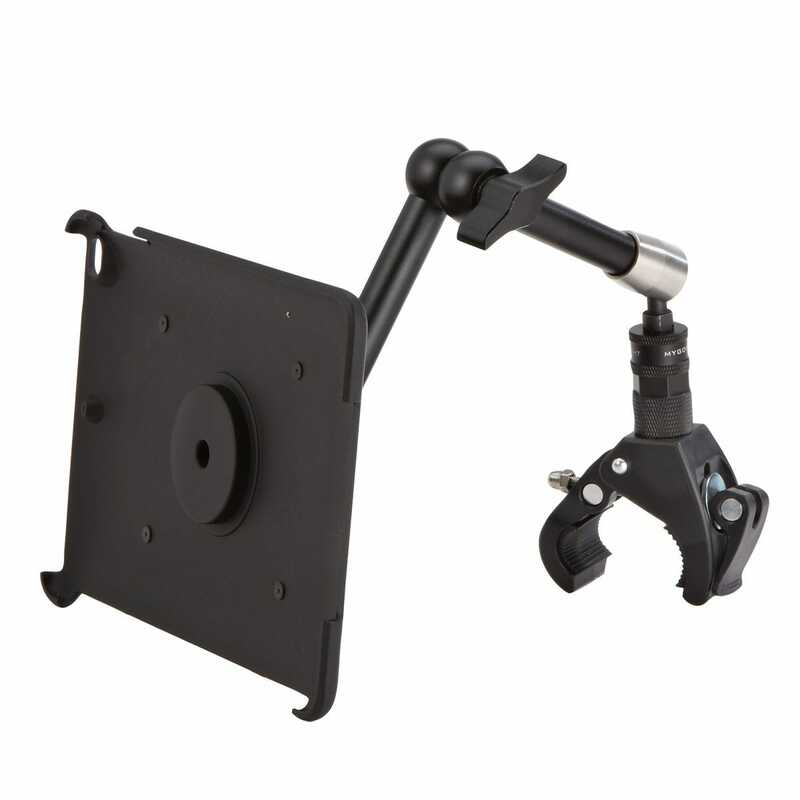 If you’re looking for the same great mount with a suction cup base instead of a claw mount, you’re looking for the MyGoFlight Suction Cup with Cradle Bundle here. iPad Air 3, iPad Pro 10.5"
My Go Flight mounts should be your first choice. Since I purchased my first iPad in 2010, I have tried almost every mounting system on the market as well a iPad knee board options. The My Go Flight system is by far the best thought out, best designed, and best engineered mounting option I have been able to find. It is far easier to fine tune adjustments than any other mounting system. My GobFlight offers a plethora of choices. The rest of the mounts I have purchased have been relegated to my own personal iPad mount museum (though I should probably put them on eBay, I don’t want others to suffer with poorer designs and inferior products). I have never been disappointed by any My Go Flight product. I can also recommend their non-glare glass screen protectors. will the claw work with the large Cessna 210 yoke? BEST ANSWER: The large claw will attach to a tube with a diameter 1" to 2.5"
Will the unit work on a Lear Jet? BEST ANSWER: I do not think it will on the yoke. If you have a tube that you can may mount it to that is 1.5 inches in diemeter then yes. mount for an asus zenpad 3s? It is 240 X 164 external size. Height is the same as the ipad pro 9.5. Width is slightly smaller. BEST ANSWER: Unfortunately it won't fit - this is a custom-molded case for the iPad. Can you interchange the suction cup with the yoke claw? BEST ANSWER: The unit does have an arm with a suction base instead of the yoke claw. Just to be clear, are you saying that the unit with the arm with a yoke claw also includes an arm with a suction cup base? If not is there a way to get both suction cup and claw? These are two separate items. 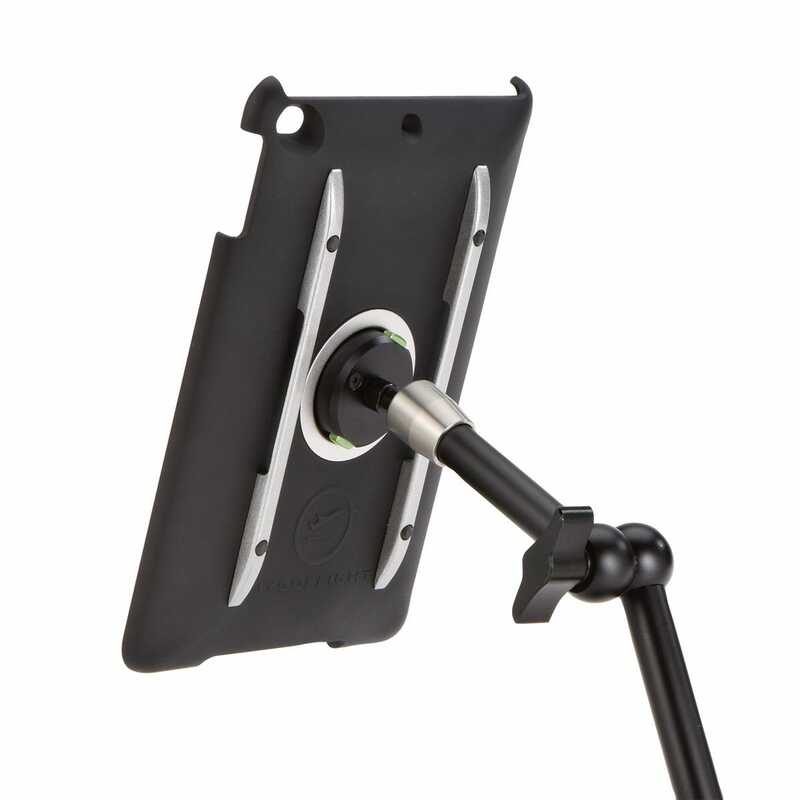 Will the Universal Phone Cradle hold the Garmin Aera 660 securely? BEST ANSWER: It will not. I would recommend the ram 7” x-grip for the 660 if you are not going to use the included yoke mount. Will this work with Piper Archer yoke? Does this product have the latest MGF sport adapter gen 3? BEST ANSWER: It does not have the Gen 3 adapter. Will the claw work with the duel yoke Bonanza? BEST ANSWER: It will work with yokes that are up to 1 3/4”. Will it hold a Samsung Tab S2 and work with a Piper Aztec Yoke and control wheel?